The highway bridge running between Old and New Mombasa. New Mombasa 105 East (NM 105 E) was a large highway that passed through the city of Mombasa, Kenya on Earth. It passed through Old Mombasa and ended in New Mombasa's city center. The highway was a significant conduit of civilian traffic. The NM 105 E ran through a subterranean tunnel beneath Old Mombasa's Liberty Street before rising and connecting to New Mombasa via a large suspension bridge. This was the main entrance to the city from the south; traveling farther down the highway would take one straight through Sector B and the industrial area to the city center. The highway featured numerous blast doors designed to shut in case of emergencies such as the bridge's collapse. 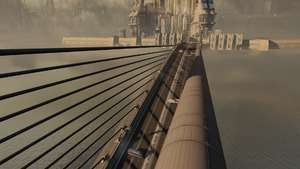 The Kilindini Bridge seen from Old Mombasa during the Covenant invasion in 2552. The highway's most spectacular feature was a special cantilever 44-cable-stayed bridge stretching over Kilindini Channel just west of Mombasa Island. Around 1.9 kilometers long, it was one of few bridges connecting New Mombasa to the mainland via Old Mombasa. Toll booths were stationed at each end of the structure. Presumably due to lack of space to erect new buildings, the highway was completely enclosed within an overland tunnel, allowing for the construction of numerous buildings on top. This gave the illusion from most perspectives that the highway was subterranean in spite of it being entirely above ground, although parts were at or below sea level. The tunnel bore a four-lane highway constructed of prefabricated sections made of polycrete. Mtangwe Underpass on the New Mombasa side passed under the Kilindini district, connecting to other streets such as Moi Avenue and Shimanzi Road in the city's industrial area. The underground highway was separated into several sections, including Sections C2, C3, and C4. The New Mombasa 105 East featured several heavy interchange gates that could be closed off by the Superintendent in the case of emergency. Typically there was a strip one either side of each section that allowed for passage uninterrupted by traffic in the main lanes. The bridge deck has a similar structure to the enclosed sections of the higwhay but with slight additions such as built-in roadblocks; these roadblocks were likewise controlled by the Superintendent. During the Battle of Mombasa on October 20, 2552, the highway was heavily damaged during intense fighting between UNSC Marines and the Covenant. Sections of the tunnels collapsed due to alien bombardment and the highway's emergency doors were activated. Covenant forces used the highway's bridge to regroup when Liberty Street was retaken by the Marines. A Type-47A Scarab followed the highway into Sector B until it passed over several buildings before it was ultimately cut off at the docks. Spartan John-117 followed the excavation platform toward the center of New Mombasa as he pressed toward the Prophet of Regret's flagship, engaging numerous light ground vehicles, aircraft, and infantry along the way. Because the emergency gates were sealed he was forced to use a service exit leading out of the western tunnel. The Kilindini Bridge, spanning the channel as seen from Old Mombasa in Halo 2: Anniversary. The highway bridge leading toward the center of New Mombasa in Halo 2. The highway bridge entrance, leading towards the city center during the invasion in Halo 2: Anniversary. The Old Mombasa skyline, as seen from the bridge in Halo 2: Anniversary. The Covenant convoy passing through the underground highway, as seen in Halo 2: Anniversary. ↑ Halo: Evolutions - Essential Tales of the Halo Universe, "Palace Hotel"